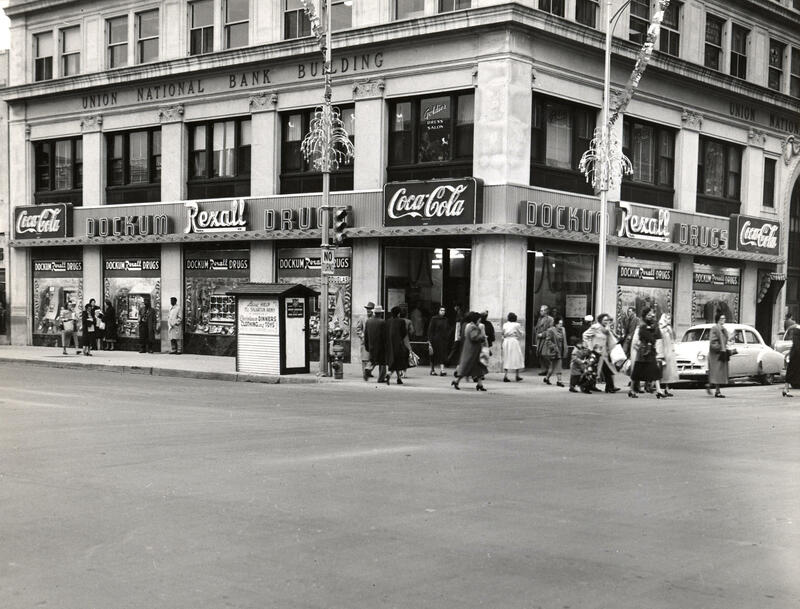 The Dockum Drug Store in 1955, three years before the sit-in. 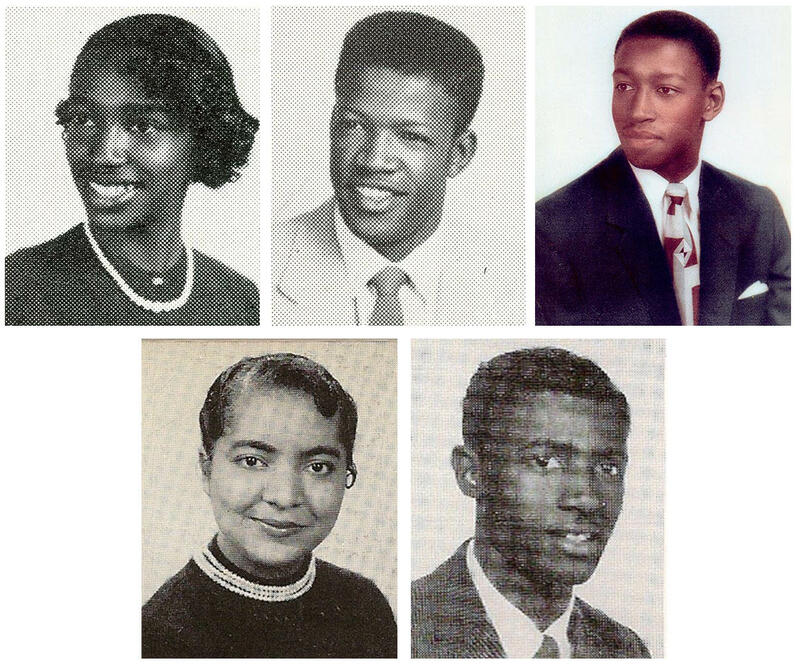 This year is the 60th anniversary of the first successful student-led sit-in of the modern civil rights movement. And it didn’t happen in the South, but rather in the heart of the Midwest: in Wichita. It was 1958, and 20-year-old Ron Walters and his cousin, 19-year-old Carol Parks Hahn, decided something had to be done about the whites-only lunch counters in Wichita. 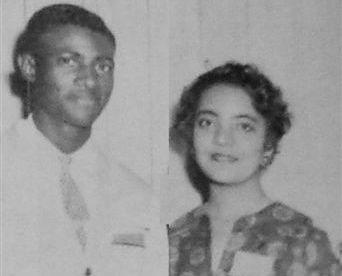 Ron Walters and Carol Parks Hahn participated in the 1958 Dockum sit-in. Both were leaders in the local NAACP Youth Council, where they learned about ways to fight discrimination. Working with other youth, the two decided to organize a sit-in at Dockum Drug Store, a popular eatery with a soda fountain in downtown Wichita. Walters died in 2010; in 2008 he recalled the sit-in to KMUW. At the time, Walters was a first-year student at Wichita State University; he had just graduated from East High and was working downtown. He noticed that he and other black Wichitans couldn’t eat at the restaurants downtown — they had to queue up at the carryout line, get their food and leave. What food they were served came in disposable containers, Parks Hahn said. “We never knew what it was to just sit there and have a glass and dishes and so forth, and plates,” she said. It was humiliating. And they couldn’t tolerate it anymore. "We had nothing to prohibit us from going and sitting. We are within the law to sit and expect to be served." 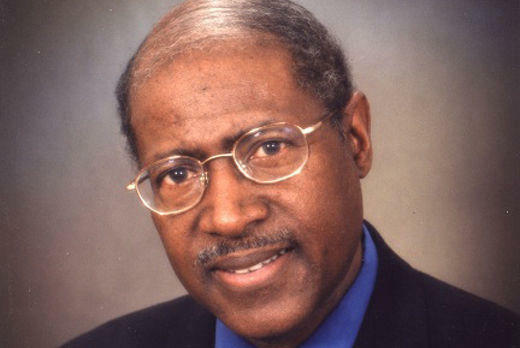 Walters became president of the local NAACP Youth Council; meetings were often held at his cousin’s home, which Walters said became a “kind of laboratory” for him in the civil rights movement. Parks Hahn’s mother, Vivian, was secretary and treasurer of the local NAACP and frequently brought prominent figures to their home: Roy Wilkins, a leader of the NAACP; Chester Lewis Jr., president of the Wichita chapter; Mamie Bradley, mother of Emmett Till; and Rosa Parks. That motivation help the teenagers organize the sit-in — a concept Parks Hahn learned about only after speaking with an attorney who served as the West Coast regional secretary for the civil rights organization. Members of the NAACP Wichita Youth Council. Top: Joan Williams, Prentice Lewis and Galyn Vesey. Bottom: Carol Parks Hahn and Ron Walters. 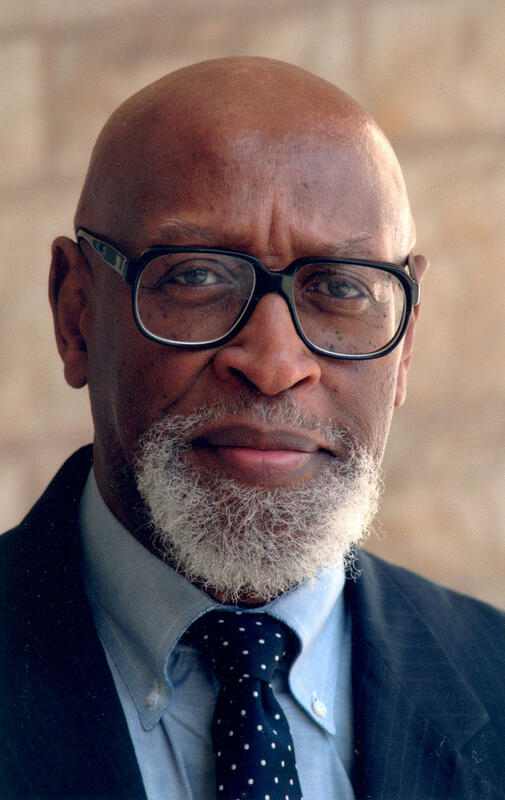 Prentice Lewis was on the NAACP Youth Council in 1958; he had joined after facing discrimination at various restaurants downtown. Joan Williams also became active during the sit-in campaign. During her teen years, she worked at a clothing store in downtown Wichita. She decided to get involved with the sit-in after running an errand for her boss at Dockum Drug Store. 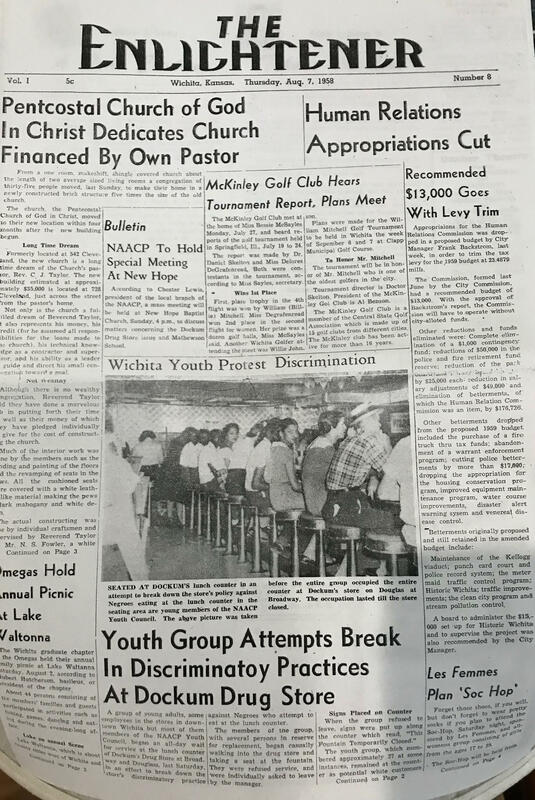 Galyn Vesey, now a director of a project that researches black Wichita, said he knew, along with the other teenagers, that the time had come to make a difference. “We cared about one another so it was just, to me, it was just the right thing to do,” he said. 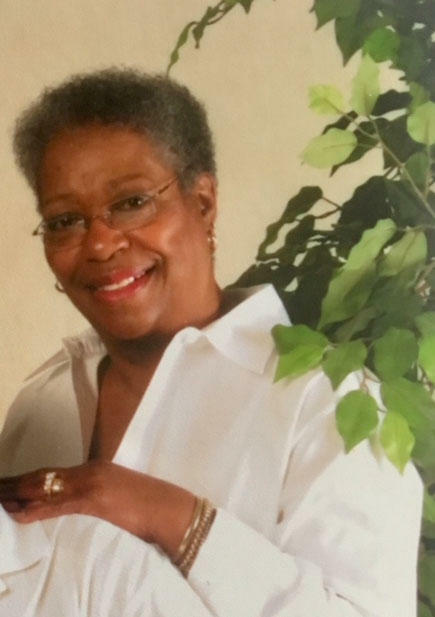 “We were loved, we were nurtured, we were mentored and we knew that our parents who lined up outside of Dockum, waiting for [families in] East Kellogg and College Hill to go to work to clean those white homes and prepare food, were being disrespected because they could have gone in while waiting for the bus to come get a cup of coffee. Though they frequently went to Dockum to purchase items, they still couldn’t eat there. Walters said many people don’t understand just how tightly segregated Wichita was. “It was like Mississippi up north,” he explained. 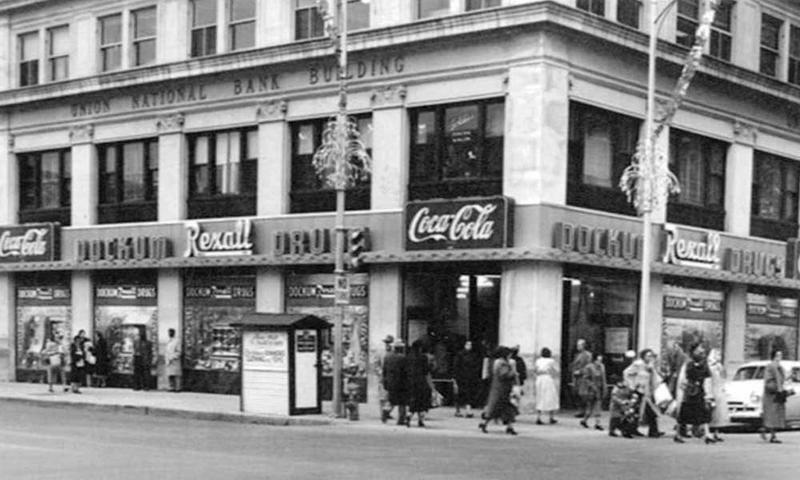 The group deliberately chose Dockum for the sit-in because it was part of the national Rexall drugstore chain. “We felt that we could do something there, in the heart of town, that it might have a consequence,” Walters said. In the spring of 1958, the teenagers began putting their plan into action — but first they needed to practice. “We were primed,” Parks Hahn said. “We rehearsed everything to do, and we knew that we when we went to Dockum’s. They held rehearsals at St. Peter Claver Church, using a manual from the Southern Christian Leadership Conference, an organization with roots in the Montgomery Bus Boycott. The teenagers prepared for every situation: what to do if someone spat on them, or hit them. Finally, they were ready to start the sit-in. The teenagers purposely wore their dress-up clothes. Joan Williams said their appearance, along with the ability to stay focused, was important. “You had to be dressed appropriately and you had to look the part and then you had to ask if you could order,” she said. “And then after that, after they wouldn't serve you, you just had to sit there. On the first day of the sit-in, in the summer of 1958, Parks Hahn got in her yellow Chevy and drove downtown. She sat at the counter on the middle stool, facing west, and ordered a Coke. "The waitresses were very nice and pleasant until they realized that we were a group of African American youth coming in to be served." The Ambassador Hotel now stands where Dockum Drug Store once was. In 2008, it was still under construction, just an empty building. Standing at the corner of Douglas and Broadway, Parks Hahn reflected back on that first day of the sit-in. Parks Hahn didn’t expect service when she ordered her soda, and was surprised when one arrived. The waitress didn’t realize she was African American. “There had never been a sustained, student-led sit-in that had been maintained for three weeks and that was able to persuade the powers … that control the drugstore chain that they were losing too much money from the students’ very polite protest and sustained protest,” Eick said. The teenagers’ success in persuading the drugstore chain to desegregate all of its stores in Kansas “set a precedent,” she said. It would be many years until other convenience stores — like Walmart and Target — to follow suit. The change did not come without some anxious moments. Parks Hahn said she was glad that the youth group's mentor, Chester Lewis Jr., was just a phone call away. 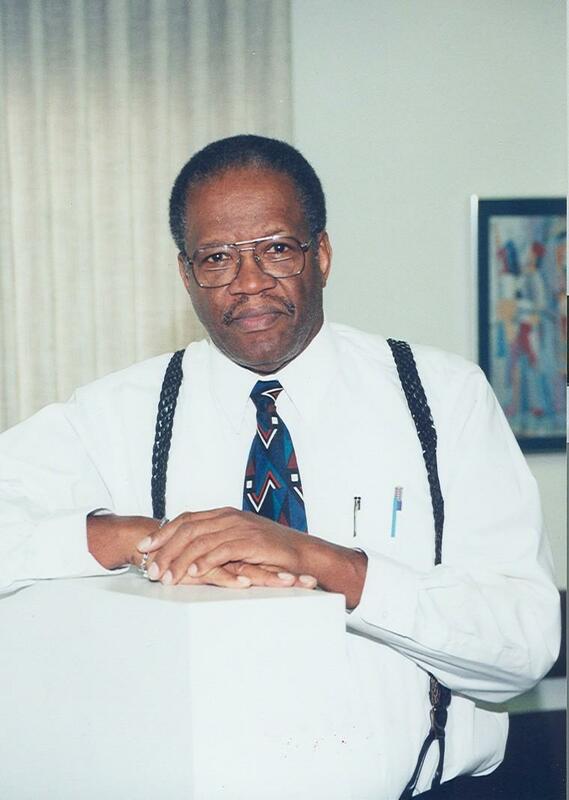 Lewis, president of the Wichita chapter of the NAACP, was a prominent lawyer who gave the students free legal advice. One day, while Parks Hahn sat nervously at the Dockum lunch counter, police officers paid a visit. One officer had a billy club in his hand. That wasn't the only time the students were made to feel uneasy. But despite outside interference, Walters said the teenagers had to remain in a state of readiness. “We had to keep those seats occupied because if we were going to cost the establishment money, it meant that we had to be there on the stools,” he said. The times they weren’t able to fill up all the stools, white customers still wouldn’t sit with them at the counter. The students had to be constantly prepared to attend the sit-in, never knowing when they might be called up. After more than three weeks of the sit-in, the day came when the owner finally made a change. The front page of the Aug. 7, 1958, issue of The Enlightener, which was an African American paper in Wichita. Days later, management would finally agree to serve the sit-in participants. Walters was doing military training in Colorado the weekend the sit-in ended; Chester Lewis called to tell him the good news. 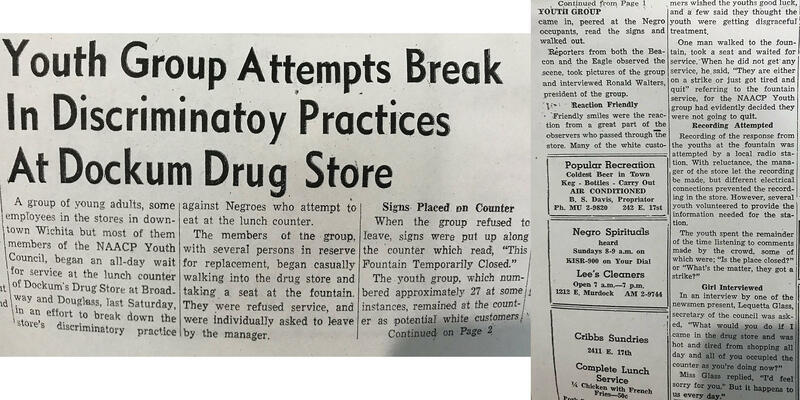 The Wichita sit-in desegregated the largest drugstore chain in Kansas almost two years before similar sit-ins began in the South. Eick said Dr. Martin Luther King Jr. commended the Wichita students, and students in Oklahoma City who led their own sit-ins shortly after. He credited the teens with “developing a strategy that would spread and change the nation,” she said. The Enlightener was one of the few media that covered the sit-in. 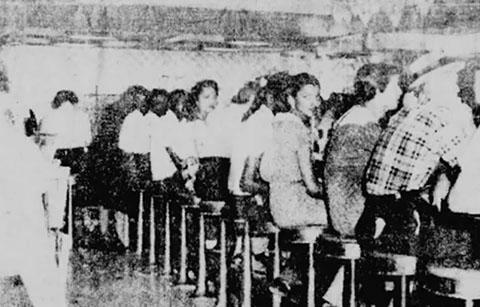 Despite its significance, the Dockum Drug Store sit-in never achieved national visibility, for a variety of reasons: The local newspaper did not want to contend with disgruntled business advertisers, the national NAACP did not sanction sit-ins at the time, and a year and a half later sit-ins would erupt across the South and attract media attention. It wasn’t until much later, in 2006, that the NAACP, at the insistence of the Wichita Chapter, acknowledged the protest that had started it all. It’s been 60 years since the sit-in; many of the participants still live in Wichita. The park downtown near Douglas and Broadway is now officially the Chester I. Lewis Reflection Square Park; a bronze replica of the Dockum lunch counter is there. 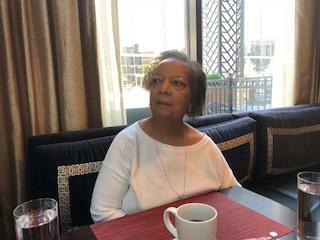 Carol Parks Haun has lunch at the upscale restaurant in the Ambassador Hotel, at the site of the former Dockum Drug Store where she was once refused service. 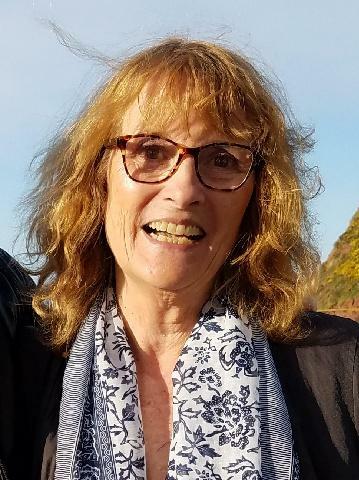 On a recent Friday afternoon, Carol Parks Hahn had lunch at the upscale restaurant inside the Ambassador Hotel, at the very location where she once was refused service. “I don’t feel as though I’m in Wichita, actually, because this is the first time I’ve even attempted to go back into this building since 1958,” she said. “Having a leisurely lunch [here] is a new experience, and it’s hope for the future for us and our descendants and all the people who are going to become Wichitans. “Wichita is growing by leaps and bounds, and I can see a real fine future for us here." Carla Eckels is director of cultural diversity and the host of Soulsations. Follow her on Twitter @Eckels.To contact KMUW News or to send in a news tip, reach us at news@kmuw.org. The design of Wichita's Dockum Sit-in Memorial was unveiled Saturday at The Kansas African American Museum's Trailblazer event. Wichita, during the mid-20th century, was a city where African Americans were blatantly discriminated against in downtown commercial spaces. For instance, black moviegoers were forced in sit in the balcony of downtown theaters. Another form of racial bias experienced by black Wichitans during this period occurred in downtown department stores. While local African Americans were allowed to purchase products from these businesses, they were not allowed to sit and eat at their lunch counters. The Kansas Health Foundation, the state’s largest philanthropic organization, gave the Kansas African-American Museum a $50,000 grant on Thursday to commemorate the 1958 Dockum Drug Store sit-in. Two Dockum sit-in participants received a standing ovation when the foundation's CEO Steve Coen made the announcement during a symposium at the Kansas Leadership Center. Coen told the audience a permanent exhibit will be established at what is now the Ambassador Hotel, the former location of the Dockum Drug Store.